YOUR help is needed at the Farm! Have you been out to the farm yet? You can’t miss the new installation: 23 brand new rows, each 97 yards long. Here’s some perspective: someone standing at the beginning of a row cannot tell if the volunteer at the other end, nearly a football field away, is jumping up and down because it is time for lunch or because they found a nest of fire ants. “Are you guys crazy? ?” I asked Sun and Steven, at the Saturday morning crew call. This is a massive undertaking; it nearly doubles the cultivated land at the Food Shuttle Farm. Sun was confident that these rows could be managed. “It’s going to be a jungle out here in a month!” Can you imagine? A forest of tomato plants; squash and zucchini leaves like elephant ears; okra plants five feet tall!! Steven concedes that it will be a good place for hide-and-go-seek, but he also says it’s going to take all of the volunteer help they can get. The field, located on the North side of the property, was graciously purchased and donated by Caroline MacNair, who owns the rest of the land where the farm is located. Until now it was used by the Food Shuttle for the composting of mulch from the city and of donations of produce, like boxes of senescent zucchini from Trader Joes. With the help of Bland Landscaping, the field was cultivated, hilled into 23 rows and covered tightly by black plastic with a special tractor attachment. The plastic is the test of a technique new to Inter-Faith Food Shuttle. It offers insulation in cooler months, erosion protection, and most importantly, a physical barrier to weed growth. It’s like putting a wall between yourself and a lion, at the zoo. Weeds cannot penetrate the wall for all their worth, which is a big help for farming of the organic method. Essentially, black plastic precludes the other organic method of weed control: weeding. 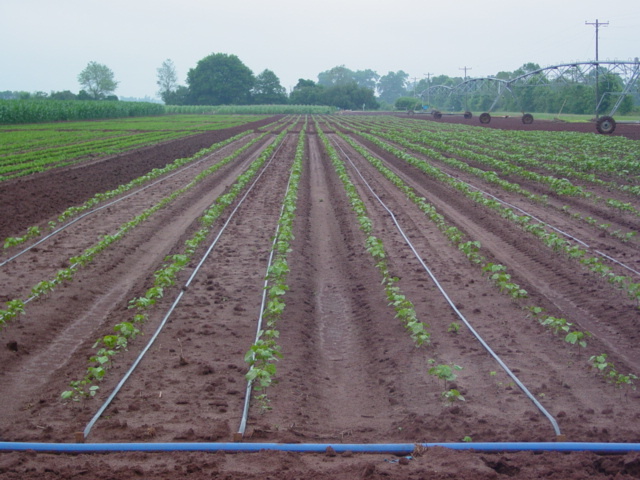 Underneath the plastic, another innovation is making its debut at the farm: drip irrigation. It’s a simple system of hoses that feeds water down each row and, like the name, dribbles refreshment through pores in the sides. This is important because the black plastic prevents a lot of rain from being absorbed, and the irrigation will help rapidly transpiring (really thirsty) plants through the dry, hot summer months. Lend a hand or donate plants! The process of planting one row with jalapeno peppers, cucumbers, zucchini, and okra took three of us about an hour on Wednesday afternoon. That is, punching a hole, placing the plant in, fertilizing and then watering. (We started with more volunteers, but it’s easy to get discouraged when the sun starts to go down.) …One row down, twenty-two to go. And one by one, the rows begin to be planted. An entire row of tomatoes was knocked out by a visiting group from the army corps of engineers in record time. Last Saturday morning, volunteers planted two more rows by noon. Currently growing are tomatoes, okra, zucchini, summer squash, cucumbers, eggplant, and sweet and hot peppers. The only thing the farm needs now is MORE PLANTS! The plants, like the land and the labor, are generously donated. They come from local plant centers (like Campbell Road Nursery, Fairview Nursery, and Grow and Share), or are raised from seed in the IFFS greenhouse. It would be impossible to fill every row yet, because the donations trickle in and there is a lot of space to fill. The staggered planting is not a bad thing, though. For example, if a row of tomato plants is planted every two weeks, this means a new row of tomato plants will become ripe every two weeks. Ideally, this will extend the season of the new field to May through November! Escape from your big-city troubles to the calm of the country. Some places call this “agri-tourism” and charge big bucks! We’ll let you get dirt under your nails FOR FREE! Volunteering is truly an educational experience. This is the internship my cohorts in the NC State Horticulture Department are clamoring to get. Where else do you get on the job experience with experts without even filling out an application. Don’t worry, there isn’t a test at the end. Where else are you going to meet people like this? All kinds of people come to the farm, so you can have a conversation on turf with people you’d never get the chance to meet. It is almost a miracle to see college students “talk shop” with retired professors; to see a woman who have traveled the world trade recipes with a family man raised in the south; to see kids arm deep in dirt and earth worms, amazed by what Sun is telling them. and a little thing I call “Limited Liability.” This means if maybe you are kind of slow planting tomatoes or you would rather feed the chickens than feed the worms, that is okay. You could even plant a tomato upside down (on accident, of course), you wouldn’t even get fired. Steven will just give you an encouraging smile and tell you to try again next time. Or, you’ll be “promoted” to watering. So, what are you doing on Saturday morning? Heck, what are you doing on Tuesday morning, or maybe even Thursday afternoon? Sun, Steven, and a crew of hard-working volunteers are working overtime, seven days a week, at the Inter-Faith Food Shuttle Farm on Dover Farm Road to ensure that our neighbors aren't going hungry. Come out and lend a hand!